Pictures and text by Catriona . Pondering place: the pond was done last, so we would know exactly how much lawn we would have left. We laid out the shape we thought we wanted and started on the rest of the garden working around it. Stephanie helped with the design. We used the bricks from the old perennial border to make it semi permanent. We also laid out the stream. We got on with the rest of the garden. 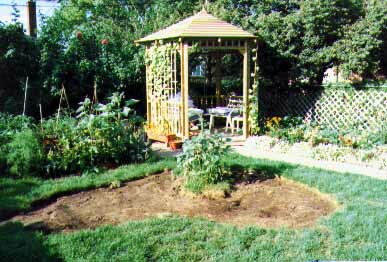 Building the gazebo, tool shed, creating new garden borders and laying out and doing the walkways. Klaus was busy all spring, summer and into the fall. We just finished the pond a few days ago. Just in time to close it for the winter. Here are some pictures to show the building of the pond. To enlarge pictures - click on the right mouse button. 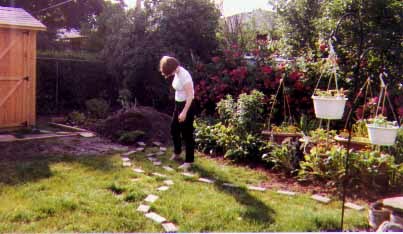 Stephanie designs the pond with bricks from the old perennial border. a little to the right..that's fine. 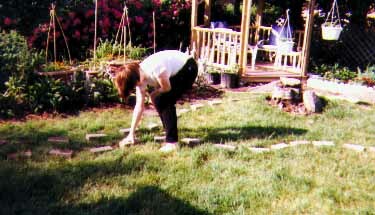 ...then you dig out the pond, making sure it's level. First you place the liner in the hole trying not to have wrinkles. ...shaping the liner as you go. Cold water! Klaus put one layer of rocks down. Then brought up liner over it and trimmed to fit and put the second layer of rock on top of the liner . First layer around the pond completed.